A glance of Egypt History timeline is significant in studying the ways of life of a community that existed several hundred thousand years ago. The civilization begins at around 6000 BC when early people settled in the Nile valley. From 5550 to 3050 BC was the Pre Dynastic Period during which small settlements flourished along the Nile. Before the first Egyptian dynasty, Egypt was divided into two kingdoms, known as Upper Egypt and Lower Egypt (Egypt History). The notable rulers of Egypt were the mysterious ‘Scorpion’ and Narmer. King Scorpion was believed to have ruled Upper Egypt and lived just before or during the rule of Narmer at Thinis. Egypt was undergoing the process of political unification. The Egyptian capital at the time was Thinis. From 3050 to 2686 BC was the Early Dynastic Period in which the first and second dynasties ruled. This period witnessed the use of hieroglyphics. King Menes is considered to be the founder of the first Dynasty. Memphis was established as the capital of Egypt, founded at around 3100 BC. The old kingdom was established in 2686 BC. From this period to 2181 BC, 3rd to 6th dynasties ruled. A large number of pyramids was constructed during this period. King Djoser was one of the 3rd dynasty kings. During the 4th dynasty, (which was founded by Snefru) the great pyramids were built in Gaza. The cult of god Ra gained importance during the 5th dynasty. The 6th dynasty was founded by Teti. 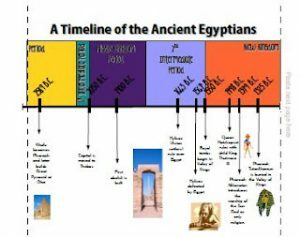 From 2181 to 2040 BC was the first Intermediate Period during which Egypt was ruled by 7th to 10th dynasties. This period witnessed the breakdown of central government. The 11th to 13th Egyptian dynasties ruled during 2040 to 1782 BC, the period being called the Middle Kingdom. The Second Intermediate period, during which the 14th to 17th dynasties ruled existed from 1782 to 1570 BC. In this period, The Hykos introduced the Egyptians to the chariot. The new kingdom was characterized by the rule of 18th to 20th dynasties. The tomb of the Valley of Kings was built. Akhenaten, Tutankhamun, Tuthmose and Ramses II and Hatshepsut were the main Pharaohs of the time. The kingdom existed till 1070 BC. From 1070 to 525 BC was the Third Intermediate period during which the Nubians conquered Egypt and restored traditional values and religion. The Late period was from 672 to 332 BC and the 26th to 31st dynasties ruled over this time. The 27th dynasty was established by a Persian king. The Greco-Roman period is said to be from 332 BC to 641 AD. It was during this period that Egypt was invaded and conquered by Alexander the Great and the Ptolemic dynasty was established. The city of Alexandria was founded. Cleopatra VII reigned in 51 BC. The Roman period began at around 30 BC. In 642 AD, Arabs captured Egypt and it became a part of the Islamic empire. From 868 – 969 AD, the Tulunid and the Ikhshidid dynasty ruled Egypt. Fatimid rulers seized Egypt and founded the Egyptian city Al-Qahirah (modern Cairo) in 969 AD.